Note: The anniversary file pages have over time been split and split again as they have grown. Please use the index below to find the month you want. The links to the rest of the files and notes on sources and contributions are at the end. 1 July 1916: Arsenal’s annual report was published showing Henry Norris as being owed £7196 by the club, while the builders of the main stand were owed £18087 (about £2.5m today) guaranteed by Henry Norris personally. It also showed that the club had bought some further properties around the ground, which would later be used to improve the entrances to the ground and as accommodation for staff. 1 July 1918: There was an explosion at the National Shell Filling Factory in Chilwell (Notts) in which 134 died as 8 tons of TNT exploded. Only 10% of the bodies could be identified. 1 July 1918 Sir Henry Norris, having demonstrated his concern for the position of women in society through the vote in favour of higher salaries for women teachers, followed this up by setting up a trust fund for his wife assigning her many of the houses he owned as a result of his building work. Within the context of the era in which women were third class citizens it was a very unusual and incredibly generous settlement. 1 July 1933: London Transport was formed by an amalgamation of the various companies that had been running public transport in the capital until that point. 1 July 1937: Reg Trim moved from Arsenal to Nottingham Forest where he played 70 games. After serving in the RAF in the war he played for Swindon and then worked in flight refuelling at Hurn (now Bournemouth) airport. 1 July 1939: The Women’s Land Army was re-formed to work in agriculture. Wolverhampton, and played around 200 games for them, winning the Second Division with them, and the 1974 League Cup. 1 July 1961: John MacLeod joined Arsenal from Hibs. He started with Edinburgh Thistle as a schoolboy then went with Joe Baker to Armadale Thistle and finally Hibs, before choosing Arsenal over Man City as his next destination. 1 July 1966: Billy “Flint” McCullough left Arsenal for Millwall. He had played 253 league games, and went on to play 19 for Millwall, before moving on to Bedford, Cork Celtic and Derry City. 1 July 1968: William Naismith “Billy” Blyth died. After leaving Arsenal he had a role in the movie “The Great Game” filmed in 1930, the first movie (as opposed to a film of a game) which involved an Arsenal player, and which pre-dated the Arsenal Stadium Mystery by nine years. appearances until 1975/6 when he played 29 games. But the arrival of Willie Young in the centre, combined with awful luck regarding injuries curtailed his career. 1 July 1977: Kevin Stead signed on a free transfer from Tottenham, one year after Terry Neill made the same move as manager. Having made no impact at Tottenham he also made no impact at Arsenal and took part in just two games. 1 July 1987: Viv Anderson sold to Man U. He had played 120 league games for Arsenal and scored nine goals and was Ferguson’s first signing after taking over at Old Trafford. league games for Arsenal and was a part of the 1989 league winning team that played the final game at Anfield to win the league. 1 July 1997: Marc Overmars (£7m from Ajax) and Man Petit (£3.5m for AS Monaco) both registered with Arsenal. 1 July 1998: Richard Hughes sold to Bournemouth. Although he spent five years at Arsenal he never played for the club, being only registered as a youth player, He had two spells with Bournemouth and a period with Portsmouth before retiring in 2014. 1 July 2002: Lee Dixon and Tony Adams, two members of the most famous of all defences, both formally retired. Dixon had played 458 league games with Arsenal and Tony Adams 504. 1 July 2006: The player loan agreement between Arsenal and Beveren ended – it is the closest Arsenal had to a nursery club since Margate in the 1930s. 1 July 2008: Mathieu Flamini left Arsenal at the end of his contract for Milan – only to return in 2013 again at the end of his contract there. After his second Arsenal spell ended he went to Crystal Palace. 1 July 2012: Gavin Hoyte released by Stevenage and signed for Dagenham. After 68 games there he moved on to Gillingham. He also elected to play for Trinidad and Tobago, and started to play for them in 2014/15. 1 July 2013: The transfer of Yaya Sanogo to Arsenal announced. He cost £390,000 and went on to play in the FA Cup final of 2014. In 2015 he went on loan to Crystal Palace and played 10 times for them. After a series of injuries he was brought back to Arsenal for 2016/17 but failed to make the first team and left on 30 June 2017. 1 July 2014: The start of Arsenal’s £170m partnership with Puma, which at the time was the most lucrative kit deal in English football history. In its opening video promoting its interest in and respect of Arsenal’s history, the company focussed on the cover of the novel “Making the Arsenal”. 1 July 2014: Arsenal announced a 3% price rise in ticket prices. It was the third rise in prices in nine years. 2 July 1970: Steve Morrow born. He joined Arsenal just after his 17th birthday in July 1987 and went out on loan to Reading, Watford and Barnet, playing his first Arsenal game proper on 8 April 1992. 2 July 1977: Bob Wilson, the goalkeeping hero of the first Double season, re-signed for Arsenal as emergency cover, but didn’t give up his TV work. 2 July 1999: Steve Bould sold to Sunderland for £500,000. He had played 287 league games for Arsenal. He returned in July 2001 as youth team coach, became head of the under 18s, and then Arsene Wenger’s assistant. of this happened through Uefa’s FFP plan. The PL evolved just such a plan but it proved unable to stop Manchester City’s financial escapades. Uefa started to water down its process in 2015 and likely failed to stop PSG. 2 July 2014: Ben Sheaf joined Arsenal from West Ham for an undisclosed fee. 2 July 2015: Ainsley Maitland-Niles loaned to Ipswich for the forthcoming season. He played 30 times for the club but was reportedly dropped after his mother made what was called an “X rated” phone call to the club. However by 2018 he was a full blown first team member. 3 July 1915: After a vigorous campaign against football continuing during the war (combined with a similar campaign to ensure horse racing did continue) the Football League confirmed that there would be no 1915/16 professional season but clubs could organise regional leagues in which players would not be paid, and “guest” appearances would be allowed. 3 July 1917: Arsenal player Gordon Hoare was commissioned as a second lieutenant in the Army Service Corps in the mechanical transport section. By the end of the war, Hoare had been promoted to lieutenant. 3 July 1920: The UK got its first roller coaster ride, at a fairground in Margate. 3 July 1925: Charles Buchan, the man who helped develop WM, re-signed by Arsenal in £100/goal deal. He played 102 games scoring 49 goals before finally retiring in 1928. Buchan’s first signing for Arsenal. 3 July 1933: Horace Cope sold to Bristol Rovers for £1500, having been signed by Chapman, playing 65 games for Arsenal. Bristol R was his final club, and sadly we know nothing more of him, save for the fact that he died on 4 October 1961. 3 July 1996 Tommy Black signed for Arsenal. He played his only game for the club as a sub in the match against Middlesbrough on 30 November 1999 and was sold to Crystal Palace on 21 July 2000. 3 July 1997: Alex Manninger transferred from Grazer AK for £1m. In 1998, with an injury to David Seaman, Alex played six games without conceding a goal, and was then dropped upon Seaman’s return. 3 July 2000: Robert Pires signed from Marseille for the astoundingly low figure of £6m. Also that summer Wiltord was purchased for £13m and Overmars went to Barca for £25m. 3 July 2000: Eduardo César Daude Gaspar (Edu) joined Arsenal from Corinthians. Unfortunately his Portuguese passport was a fake, but he qualified for an Italian passport because of his father was Italian. He signed again for Arsenal on 16 January 2001. 3 July 2001: Sol Campbell signed after 11 years with Tottenham. He had played 255 times for Tottenham, and stayed with Arsenal for five years before moving on to Portsmouth. 3 July 2013: Vito Mannone moved to Sunderland for about £2m. He went on to play in the League Cup final that year having defied Man U in the semis and became their player of the year. However after an 8-0 defeat to Southampton in 2014 he fell out of favour for a while. 4 July 1931: Tommy Black joined Arsenal from Strathclyde. He played 16 reserve games in 1932/3 before playing in the notorious defeat to Walsall in the FA Cup. He was transferred to Plymouth Argyle six days after the Walsall game. 4 July 1977: Six weeks after winning the FA Cup with Man U Tommy Docherty admitted his affair with Mary Brown, the wife of the club’s physiotherapist. The club’s directors decided that he had broken their moral code and he was sacked. played for Hartlepool, Leeds and Oldham. 4 July 1998: Dennis Bergkamp became the Netherlands top scorer. He went on to score 37 goals in 79 international games – despite not wishing to fly to away matches. 4 July 2002: Start of the Alex Manninger adventure at Espanyol which ended 7 weeks later with the club saying they never had the money to buy him. The fee was £760,000. from Barcelona in 2011 as a youth player he had been on loan at Watford during 2013/14 before in September 2014 making his Arsenal debut following a spate of injuries to other defenders. In 2016 and 2017 he was daily reported across all media as moving back to Barcelona. Amazingly it was all lies. 4 July 2014: Hugo Keto joined Arsenal for an undisclosed fee from HJK Helsinki. He has since gone on to be the under 21 keeper for Finland and under 23 keeper for Arsenal. 5 July 1910: Harry Logan signed for from Sunderland, having previously played for Shettleston, in the East End of Glasgow. His first match was on 3 September against Bury (although some sources quote a later date), in a 1-1 draw, playing initially at insight left, and later in the season at inside right. After 11 league games ending in March 1911 he seems to have stopped playing football. 5 July 1920: Amidst floods and insurrection, the first airmail service between London and Amsterdam was launched. 5 July 1978: Paul Barron joined from Plymouth as cover for Pat Jennings and went on to play eight games before moving on to Crystal Palace. In all he played over 400 games before retiring and becoming a coach in the USA. 5 July 2011, Jérémie Aliadière signed a deal for Lorient, and played 76 games over the next three seasons. 5 July 2013: Terry Burton became the reserve-team manager at Arsenal. Having captained the 1971 Youth Cup team he had worked at Arsenal as a coach, before moving through various clubs, and returning to Arsenal in 2013.
term contract went to Freiburg on a season long loan. He played just 16 times for the club and had difficulties with the manager, before returning in June 2014. 5 July 2013: Johan Djourou completed a loan move to Hamburg following a loan period at Hannover. He later signed permanently for Hamburg. 6 July 1916: During the 1st world war Arsenal’s chair, Henry Norris, undertook work for the War Office. The records of this work were destroyed in a fire during the second world war, and so piecing together his work is difficult but we know he worked in Worthing for the WO sorting out recruitment before this date, but was back in London by this date as he made a speech at a Chamber of Commerce event in Fulham. Such is the way the story is recovered – by joining the dots from the information we do have. 6 July. 1959: David Bowen sold to Northampton Town for £5,000. He had previously been purchased from Northampton, and now went on to play 22 times for them in the 1959/60 season before retiring. 6 July 1995: Jimmy Carter left on a free transfer for Portsmouth. Having come from an unsuccessful spell at Liverpool he played just 25 times in four years for Arsenal and had had two loan spells at Oxford. 7 July 1917: Islington’s Baby Week concluded. These “Weeks” were held across the country to encourage mothers to work harder to protect the health of their children despite the hardships of wartime, amidst a growing concern about the rise in infant mortality in the capital from malnutrition and the continuing measles epidemic. – his only long term assignment after leaving Arsenal. 7 July 1997: Paul Merson to Middlesbrough for £5m. He stayed for just one season and played 48 games, before moving on to Aston Villa where he played 101 games. After that he played for Portsmouth and Walsall before dropping out of the league. 7 July 1998: Following the arrival of Arsene Wenger David Platt was released from his Arsenal contract one year early. He moved to Nottingham Forest but only played five games before retiring. 7 July 1999: Laurie Scott died. In 1951 he moved to Crystal Palace as player-manager but after Palace had to apply for re-election in 1954 he moved on to Hendon and later Hitchin Town. 7 July 1999: Jason Crowe moved to Portsmouth on a free transfer. In a career lasting to 2013 he played over 400 league games, with clubs including Palace, Brentford, Grimsby, Northampton, Leeds, Leyton Orient, and finally Corby Town. 7 July 2010: Laurent Koscielny completed his move to Arsenal from Lorient for whom he had played 35 games for £8.45 million. Arsene Wenger stated in 2015 that he felt this was his best value transfer of the past ten years. 8 July 1970: David Court sold to Luton Town having missed out on the Fairs Cup final games through injury. He played 168 league games league games for Arsenal, and in 1996 he returned to Arsenal as head of youth development. 8 July 1971: Don Howe left Arsenal to manage WBA. The move was not a success and WBA were relegated in 1973. Don moved on to Leeds and to Galatasaray, before coming back to Arsenal in 1977 as coach with Terry Neil as manager. 8 July 1975: David O’Leary became a full professional. He played his first game in the league aged 17, and went on to play 27 games in 1975/6, his first season. 8 July 1977: Wilf Rostrom moved to Sunderland. He had played 17 league games for Arsenal and scored two goals. In all he played nearly 500 league games, including 317 for Watford. After ending his playing career he spent a few years in management before leaving football in 1994. 8 July 1990: Anders Limpar signed from Cremonese. He played 94 league games in a four year spell at Arsenal, before moving on to Everton. He later won the Swedish league with AIK. After retiring in 2000 he went into coaching and then business. 8 July 1997: St Albans 1 Arsenal 4. The first friendly in what was to be the second Double season. The second double: part 1, part 2, part 3. 8 July 1999: Kaba Diawara sold to Marseilles after just 12 games. He played for 17 different clubs but never more than the 60 games he played for Bordeaux (with whom he won the league). He retired in 2011.
non-league football playing for eight different clubs before retiring in 2009. 8 July 2002: Pascal Cygan joined from Lille for whom he had played 179 league games. He played 98 matches for Arsenal (including 20 games in the Champions League). 8 July 2006: Sol Campbell confirmed his departure from Arsenal after 135 games. He moved on to Portsmouth, where he played another 95 league games. In 2009/10 he returned to Arsenal once more for a further 11 games. 9 July 1910: William Rippon joined Arsenal. He had already played for Hackenthorpe, Rawmarsh Albion, Sandhill Rovers, Kilnhurst Town, and Bristol City. 9 July 1938: As a sign of things to come, gas masks were issued to the population at large. SEGA worth £10m, with this match. where he was also a coach. 9 July 2007: A season long loan spell to Colchester for Matthew Connolly was announced, but this was curtailed on 2 January 2008 after he had played 16 games and scored two goals, and his permanent transfer to QPR was announced. He was called up for the England under 21s shortly after. 10 July 1916: The Princess Royal, colonel-in-chief of the 7th Dragoon Guards (the Princess Royal’s Own), opened a new building in the grounds of Fulham’s board of guardians’ infirmary. The building was to be used by the military for the duration of the war, and Captain Henry Norris was part of the welcoming party. 10 July 1920: Cyril Grant born. Seen as a possible post war replacement of Ted Drake, he played just two games for Arsenal in the difficult 1946/7 season. 10 July 1921: The truce in the Irish war of Independence came into effect. 10 July 1956: Frank Stapleton born, Dublin. He joined Arsenal in 1972 as an apprentice (having tried his hand first with Man U) and played his first game in 1975 against Leicester in a 1-1 home draw. 10 July 1975: Bob McNab completed a free transfer to Wolverhampton. He played 13 league games for them before moving to the US league, and then finished at Barnet. He managed Vancouver and Tacoma, was caretaker manager of Portsmouth in 1999 and then worked as a property developer in Los Angeles. See also here. 10 July 1985: Park Chu-Young born. In 2004 he won the Golden Ball for the most valuable youth player, and was Asian Young Footballer of the Year in 2010. 10 July 1988: A key moment in the history of the League as ITV proposed different payments to different clubs, opening the way to separate negotiations along the lines of the Spanish League’s arrangements. 10 July 1995: David Platt transferred to Arsenal from Sampdoria for £4.75. Platt said that Bruce Rioch had been on holiday in Portugal and flew to Italy to make the signing and they “hit it off straight away”. 10 July 1998: Arsenal, the double winners of 1997/8 beat Boreham Wood 5-2 amid rumours that Ian Wright was about to leave. In July 1998 he went to West Ham but never found his form again. 10 July 2014: Arsenal sign Alexis Sanchez from Barcelona for around £30m. He became an immediate success being the club’s top scorer in his first season and showing an unending drive and passion while on the pitch. Until he wanted more. 11 July 1922: Angus McKinnon transferred to Charlton after 217 appearances in 14 years, and then in 1923 joined Wigan Borough who were then under the managership of former Woolwich Arsenal player Charlie Bell before moving on to New Brighton. 11 July 1956: Ralph Guthrie transferred to Hartlepools Utd, his home town club. He had only played twice for Arsenal, but was part of Hartlepools push for promotion following his return. 11 July 1977: Don Revie resigned as manager of the England national football team after three years in charge. The following day he accepted a four-year contract worth £340,000 to take charge of the United Arab Emirates national team, making him the highest-paid football manager in the world. He was considered utterly disloyal. 11 July 2003: Peterborough 1 Arsenal 0 – it was followed by Barnet 0 Arsenal 0. In fact the club only won four out of nine pre-season games, but still did rather well in the season to come. As you might recall. 11 July 2008: Arsenal fans voted Robert Pirès as the club’s sixth greatest player of all time, having spent six seasons at the club and played 189 games. He continued playing after leaving Arsenal, including eight games for FC Goa in 2014/15. played for four years, making 121 league appearances. 11 July 2011: Arsenal signed Gervinho from Lille. He had played for Beveren and Le Mans previously, and made 67 appearances for Lille, scoring 28 goals. 12 July 1935: There was rioting in Belfast following the annual Orange parades, with 13 dead, hundreds injured and around 2000 Catholic houses destroyed. 12 July 1958: Steve Williams born in London. He signed for Southampton straight from school, and made his debut in a 1–0 victory away to Portsmouth aged 17 helping to relegate Portsmouth Division 2. 12 July 1963: Gerry Ward sold to Leyton for £8000. He made 44 league appearances for them before moving into non-league football. He died aged just 57 in 1994. 12 July 1974: Ray Kennedy sold to Liverpool. He had played 158 league games for Arsenal, but went on to play 275 for Liverpool before moving onto Swansea and finally Hartlepool, retiring from football in 1984. 12 July 1974: Brian Kidd purchased from Man U for whom he had played 203 league games and scored 52 goals, after Manchester United were relegated to the second division and felt they could no longer afford his services. 12 July 1977: Red Star Belgrade 3 Arsenal 1 (in Singapore) (Macdonald) at the start of a four match tour which included two matches in Australia. 12 July 1995: George Graham found guilty of receiving £425,000 payment from agent Rune Hauge following the purchase of John Jensen and Pål Lydersen. He was dismissed by Arsenal and banned for one year by the FA. 12 July 1995: Stefan Schwarz transferred to Fiorentina. He had played 34 league games for Arsenal and later played for Valencia and Sunderland. It is said that Sunderland inserted a clause in his contract that said that he could not travel into space. games. He had played in the same Auxerre team as Abou Diaby. 13 July 1856: Frederick Beardsley born. He worked in a Nottingham government munitions factory and played for Nottingham Forest as an amateur keeping goal in the FA Cup semi-final against Queen’s Park. ?13 July 1904 Phil Kelso officially started his duties as manager. He introduced the notion of professionalism to Arsenal, insisting that players live locally, didn’t drink, didn’t smoke, and got the players together for matches a day or two before, to start preparations. 13 July 1910: Woolwich Arsenal Football and Athletic Company Limited (the company which still exists as the ultimate company that owns the club) issued a financial statement showing it was already £700 in debt, through paying the players’ close season wages. 13 July 1920: In one of its most appalling acts the London County Council banned people who were not English nationals from working for the council – an act that was legal at the time. 13 July 1936: Jimmy Dunne sold to Southampton. He never replicated his amazing goalscoring form that he showed at Sheffield Utd and after he was dropped was described in the press as the most expensive reserve in English football. 13 July 1995: George Graham banned from football for one year as a result of his taking illegal payments. He then returned with Leeds Utd before also managing Tottenham. 13 July 1998: Ian Wright having become the club’s all time record goal scorer left Arsenal to join West Ham. He played 22 league games for them, and also played for Nottingham F., Celtic and Burnley before retiring. front page in relation to the previous day’s triumph for France. 13 July 2000: Jay Bothroyd moved to Coventry. He won the FA Youth Cup for Arsenal against Coventry in 2000 just ahead of his move, but never played for Arsenal in the league. He later played 116 league games for Cardiff. the votes as Arsenal came second in the league, 12 points behind Chelsea. 13 July 2011: Malaysia XI 0 Arsenal 4 (Ramsey, Vela, Walcott, Rosicky) – the first match of the pre-season tour. 13 July 2017: Arsenal opened their Australian tour with a 2–0 win over Sydney FC, with Mertesacker opening his final season as a player with an overhead kick to score the first goal. 14 July 1890: Tommy Winship born in Newcastle upon Tyne. He was known as ‘Tiny’ being only five feet four inches tall. He started out playing for Wallsend Park Villa in the Northern Football Alliance and joined Woolwich Arsenal in 1910. 14 July 1947: Archie Macaulay signed from Brentford for £10,000 having played with Rangers and West Ham and served as a physical training instructor in the war. alongside Terry Neill, who described Dixon as “my best friend”. 14 July 1989: Rhy Wilmot transferred to Plymouth after eight league games for Arsenal and three loan spells. He played 133 times for Plymouth and retired from playing in 1997, after which he became a goalkeeper coach. 14 July 1992 John Jensen signed from Brondby. The signing was, in 1995, shown to involve the agent of Jensen paying George Graham, a deal that led to Graham’s dismissal. Jensen played 132 games for Arsenal over four years before returning to his former club. 14 July 1995 David Platt joined from Sampdoria (also reported as 11 July in some quarters). He played 88 times for Arsenal before being released one year before the end of his contract, and then went into management. 14 July 1998: Scott Marshall transferred to Southampton. The move however was not a success and he quickly moved to Brentford. He has since moved into club management. 14 July 1999: Stefan Malz signed from TSV Munich for whom he had played 36 games, but only managed six league games in his two years at Arsenal. 14 July 2004 Manuel Almunia signed from Celta Vigo. (Different dates often quoted). Almunia never played for Celta Vigo, having had three loan spells, but went on to play 109 times for Arsenal. 14 July 2005, Arsenal sold Patrick Vieira to Juventus for €20 million. Also reported as 21 July. Juventus won the league that season but were stripped of the title for wholesale match fixing, and relegated, and Vieira quickly moved on to Inter. 14 July 2013: Arsenal beat Indonesia 7-0 at the start of a pre-season tour. Walcott, Akpom, Giroud (2), Podolski, Olsson, Eisfeld get the goals. 14 July 2015: Carl Jenkinson loaned to West Ham for the season. He played 20 times having played 32 matches in the previous season before an injury forced him back to Arsenal for repairs. 15 July 1946: Cyril Grant joined from Lincoln and was seen as a possible replacement for Ted Drake. He was one of 18 players newly recruited to the club for the first post-war season, but as with many others, was not a success. 1957 oversaw their Cup victories against Wolverhampton and Tottenham losing finally to Manchester United. 15 July 1979 John Hollins joined from QPR. He played initially for Chelsea (including a spell as captain) and in 12 years knocked up 436 appearances including 167 consecutive games and then had four seasons at QPR before moving to Arsenal aged 33.
play 49 times for Arsenal before moving on to Everton in 2000. 15 July 2002: Arsène Wenger became a member of Legion d’Honneur. The Order was established by Napoleon Bonaparte on 19 May 1802 and which is the highest decoration in France. 15 July 2006: Barnet 0 Arsenal 0. This opening of the pre-season games was played just before the first match at the Emirates – the Bergkamp testimonial. 15 July 2015: Singapore XI 0 Arsenal 4 (Akpom 3, Wilshere). This was the start of only the second unbeaten pre-season in Arsenal’s modern history. The first was in 2005, In the early 20th Arsenal had several unbeaten end of season tours. 15 July 2017: Arsenal played the second game of their Australian tour, against Western Sydney Wanderers, in front of 83,000 people. Arsenal won 3–1 after first-half goals from Olivier Giroud, Aaron Ramsey and Mohamed Elneny. 16 July 1917: The London Combination announced how it would run its wartime league for clubs in the capital in the season to come. The league was reduced to 10 clubs from the 14 of the previous season, removing the four non-London clubs: Watford, Luton, Southampton and Portsmouth, and leaving them to fend for themselves. 16 July 1936: The nation’s collective heartbeat stopped as George McMahon tried to shoot King Edward VIII at the Trooping of the Colour. 16 July 1946: John Hollins born in Guildford into a family in which both father and grandfather played football, as well as his three brothers. 16 July 1954: Jimmy Bloomfield signed. He played initially for Hayes moved on to play for Brentford in 1952, but when the club were relegated from Division II into Division III South in 1954 he moved to Arsenal for £8000. 16 July 1962 Joe Baker was Billy Wright’s first marquee signing and Arsenal’s record signing at the time. He had been Hibernian’s top scorer for four years getting 102 goals in just 117 league games before moving to Torino. 16 July 1963: Bob Wilson signed as an amateur, having been playing reserve games for Wolverhampton while studying at Loughborough College (now Loughborough University) to train as a teacher. 16 July 1977: Singapore 1 Arsenal 5 (Macdonald 3, Stapleton, Brady). This was the second match of a four game tour also taking in Yugoslavia and Australia. 16 July 1996: Valur Gíslason transferred from Fram Reykjavík. He never played a league match for Arsenal, and in 1999 moved to Strømsgodset in Norway, before then returning to Fram. 16 July 2005: Barnet 1 Arsenal 4 (Hleb, Henry, Bergkamp, Hoyte). This was the start of the first pre-season series of the modern era in which Arsenal won each of six games scoring 20 goals along the way. 16 July 2008: Alexander Hleb signed for FC Barcelona from Arsenal around €15 million plus €2 million if Barcelona won the La Liga. The club duly came first in 2008–09 which took his transfer deal to €17 million – just about what Arsenal paid for him. 16 July 2011: Hangzhou Greentown (China) 1 Arsenal 1 (Vela). Match two of a six game pre-season series, after beating Malaysia 4-0 three days earlier. 16 July 2013: Seb Squillaci to Bastia on a free transfer. Although only given a one year contract this was extended and he played over 50 games for the club. 16 July 2013: The tale of Arsenal’s running man begins in the Far East. He ran alongside the team bus for so far that he was invited on board, and later came to a match at the Emirates Stadium. 17 July 1897: Roger Ord joined from Hebburn Argyle. During his time at Arsenal he kept 29 clean sheets out of his 99 games, a ratio of 3.41 percent which makes him the 16th highest on the Arsenal clean sheets list. 17 July 1888: Harry Logan born. He signed for Arsenal in 1910 and played 11 times for the club, but was only on the winning team once. 17 July 1903: Samson Haden born near Barnsley. He started his working life as a miner before playing for Castleford Town in March 1922, and was brought to Arsenal by Leslie Knighton. He was the player who crossed for Buchan’s first goal for Arsenal. 17 July 1922: With the Prime Minister himself implicated, a Parliamentary Committee was set up to investigate the awarding of honours for cash. On the same day County Hall on the bank of the Thames was opened as the new HQ of the London County Council. 17 July 1940 Joe Baker born and went through several junior Scottish clubs before playing for Hibernian and was their top scorer for four years getting 102 goals in just 117 league games. The Hibs board apparently refused to up his weekly wage from £12 to £17 and so sold him to Torino for £75k. and retired from professional football soon after. 17 July 1977: Fulham, the club Sir Henry Norris helped take into the Southern League, and then the Football League, were banned from the transfer market due to a reported £700,000 debt. 17 July 1991: Team Malarvik 1 Arsenal 4. Campbell, Smith, Groves (plus og). This was one of eight pre-season friendlies played between this day and 7 August. Team Malarvik played in Stockholm. I’m not sure they are still in existence. 17 July 2004: Barnet 1 Arsenal 10. Reyes got three, Van Persie one, Bergkamp two. Jeffers got a second half hat-trick. Quincy Owusu-Abeyie got the other one on 70 minutes. This match took place in the midst of the “49”. Arsenal were undefeated in their eight pre-season games. See also here for more details. 17 July 2008: Gilberto sold to Panathinaikos. He played 76 games for them before moving on to Grêmio who he played for in 2011/12. 17 July 2010: Barnet 0 Arsenal 4 (Arshavin, Simpson 2, Nasri). At this time pre-season took on a regular format: the Barnet game, a training camp in Austria and then the Emirates cup. 17 July 2013: Vietnam 1 Arsenal 7. (Giroud (3), Oxlade Chamberlain, Akpom, Miquel.) The second of seven pre-season games, following one in Indonesia, and followed by a match in Japan. injuries and he missed a chance to play in the Cup Final. 17 July 2015: Yaya Sanogo loaned to Ajax. After only three games he moved on in February 2016 to the youth team before moving to Charlton on loan where he started to get a decent number of games. 17 July 2017: Arsenal beat Bayern Munich 3-1 in a pre-season friendly. 18 July 1919: The Cenotaph was unveiled and the following day was designated Peace Day with victory parades in many towns. Unfortunately it didn’t always go smoothly as rioting ex-servicemen burned down Luton Town Hall. 18 July 1971: Ray Parkin died aged 60. He played 25 games for Arsenal from 1925 to 1936 and scored 11 goals. He also played 232 games for the reserves winning the Football Combination five times at a time when Combination games regularly got crowds of 7000, sometimes far more. definitive guide to the club’s progress until 1954, although it did repeat many serious errors and omissions found in earlier histories – and invented quite a few false tales. 18 July 1987: George Graham signed a new five year contract as Arsenal manager, having taken the club to 7th in 1986/7, the highest position since 1982. 18 July 1998: 18 July 1998: Enfield 0 Arsenal 0. The second of a six match pre-season run which ended with Arsenal winning the charity shield 3-0 against Man United. 18 July 2003: Philippe Senderos joined Arsenal from Servette. He stayed with Arsenal until 2010 and played 84 league games as well as having two loan spells with Milan and Everton. 18 July 2005: Emmanuel Adebayor joined Manchester City for £25 million. He played 34 times for them, which when salary is included works out at over £1m per game – even more than Barce paid per game for Henry. He later moved to Tottenham. didn’t stop him subsequently and illegally negotiating his own move to Chelsea just one year later. 18 July 2009: Tomáš Rosický played 45 minutes against Barnet, following an absence of 18 months due to successive injuries following a game against Newcastle on 26 January 2008. The score was 2-2 with goals from Arshavin and Barazite. hampered by injury before moving on to Barcelona. 18 July 2015: Arsenal beat Everton 3-1 in the final of the Asia Trophy with Walcott, Cazorla and Ozil scoring. It was the second of five consecutive wins pre-season. 18 July 2016: After a long run over loan spells Wellington Silva was finally transferred to Fluminense. 19 July 1915: The FA and Football League held their AGMs. The League voted in favour of paying footballers during wartime, the FA against it, resulting in chaos. Eventually the League conceded. The FA then met the League and the Southern League and agreed there would be no FA Cup, but there could be regional leagues in the north and midlands. This left the south and the north east without any football. Scotland had already voted to continue with professional football. 19 July 1954: Joe Haverty signed from St Patrick’s Athletic, and although only 18 immediately made his debut for Arsenal. He stayed until 1961 when he moved to Blackburn. 19 July 1995: Alan Smith announced his retirement. Between 1987 and 1995 he played 264 league games for Arsenal, scoring 86 goals. He went on to have a career as a commentator and reporter. 19 July 1996: A 0-6 away win to St Albans City on this, with a team including much of the first team regulars like Dixon, Merson, Stephen Hughes etc, did not prepare supporters for four subsequent defeats and a draw in the rest of the pre-season. Fortunately a new manager was ready to step in. did not follow up the option of signing the player. 19 July 2007: Gençlerbirliği 0 Arsenal 3 (Van Persie 2, Walcott). The seven match pre-season run saw the introduction of Bacary Sagna and Eduardo into the squad. 19 July 2014: Arsenal began their pre-season games with a 0-2 away victory over Borehamwood, Olson and Afobe getting the goals. Arsenal’s team included many younger players hoping to make an impact including Coquelin and Bellerin. 20 July 1943: Bob McNab born. From 1963 to 1966 he played 68 games for Huddersfield Town before moving on to Arsenal. 20 July 1977: Australia 3 Arsenal 1 (Armstrong). The match was notorious for a drinking spree by the players after the game which saw Neill threaten them with expulsion by only one player (Hudson) ultimately was punished and he left the club. Neill’s authority was seriously diminished by the event. over 200 times. He finished his career in 1999 with Scarborough. 20 July 1991: FC Trollhättan 0 Arsenal 1 (Hillier). The second of eight pre-season friendlies in the build up to the first ever all-London charity shield match, against Tottenham who had won the FA Cup the previous season. 20 July 1993: Eddie McGoldrick’s first match – a friendly v Orient. He had played 147 matches for Crystal Palace where he had played alongside Ian Wright and went on to play 57 games for Arsenal. 20 July 1997: Stade Nyon 0 Arsenal 4 (Mendez Boa Morte Overmars Bergkamp;. One of the friendlies before the second double season. 20 July 1998: Uefa approved Arsenal’s application to stage Champions League games at Wembley. The move allowed over twice as many people to see the games as would be possible at Highbury, and provided proof that the club could draw in enough support to fill the proposed new stadium. 20 July 2003: Gael Clichy signed from Cannes for whom he had played 15 times having graduated to the first team, after two years in the junior teams. Although the club was also the launch pad for such players as Zinedine Zidane, and Patrick Vieira, it was wound up on July 1st 2014 because of its financial situation. 20 July 2004: Martin Keown sold to Leicester City having won the league and FA Cup three times each plus the Cup Winners Cup. He played 17 times for Leicester and then five for Reading before retiring. 20 July 2005: SC Weiz 0 Arsenal 5 (Flamini, Henry, Bentley, Bergkamp). Part of the sequence in which Arsenal won every single pre-season game. 20 July 2009: Adebayor went to Man City for £25m on 20 July. He had cost just £3m three years earlier, and as a quick profit sale must rank alongside Anelka who moved from £250,000 to £25m also in three years. Three years after joining City he was told he was not part of their plans and could leave. 20 July 2013: Andre Santos transferred from Arsenal to Flamengo after a short loan spell with Grêmio. He played 28 times for Flamengo before moving on to Goa. 21 July 1898: Tom Whittaker born in Aldershot. His prime interest in his early days was in being a marine engineer, but he was spotted playing football while serving his country, and in 1919 signed for Arsenal. As a manager he won the league twice and the Cup once, as did Allison and Chapman before him. 21 July 1953: Brian Talbot born in Ipswich. He started his career with Ipswich Town in 1968 before graduating to the first team in 1972 playing 177 games for the club. 21 July 1987: Alan Smith’s first appearance for Arsenal, in the Barrie Vassallo Testimonial. He had transferred from Leicester City where he had played alongside Gary Lineker, but was immediately loaned back to the club until the summer of 1987. 21 July 2000: Tommy Black and Julian Gray released to Crystal Palace. Black played in the Youth League winning side of 1998 and both players won promotion with Palace in 2004. 21 July 2005: Samir Nasri fractured his right fibula during a training session while playing for Marseilles. 21 July 2014: Wellington Silva loaned to Almeria until June 2015. He was then able to obtain a Spanish passport through length of residence meaning he could play anywhere in the EU. 22 July 1966: Tony Burns transferred to Brighton. He played as a goalkeeper 31 times for Arsenal. He continued playing until 1979, most notably playing 90 games for Crystal Palace, and then became a manager, and later goalkeeping coach. 22 July 1971 Jon Sammels sold to Leicester for £100,000, after becoming a victim of the “boo-boys” in the crowd. He had played 215 league games and went on to play 241 for Leicester, leaving them for Canada in 1977. 22 July 1989: First appearance of goalkeeper Alan Miller in a friendly against Skelleftea. He played nine times for Arsenal and then after several loan spells moved to Middlesbrough in 1994. 22 July 1990: Andy Linighan and David Seaman debuts v Varberg Bois. Linighan joined from Norwich while Seaman came from Queens Park Rangers. 22 July 1992 David Rocastle sold to the league champions Leeds for £2m. Later reports strongly suggested that he was very much sold against his will and was deeply distressed by the move forced upon him by George Graham. the nine pre-season games all told before embarking on the Unbeaten season. 22 July 2004: Mathieu Flamini signed from Marseille on a free transfer – a profile he continued through his career, never once commanding a transfer fee. He played 102 times for Arsenal before moving on to Milan; returning in 2013, and then leaving again for Palace. 22 July 2006: The Emirates Stadium opened with the Dennis Bergkamp testimonial, Dennis’ father kicked off the match. Dennis had played 423 games for Arsenal, and was part of both Arsène Wenger’s two Doubles and the Unbeaten Season. 22 July 2016: Arsenal signed Bolton’s Player of the Year Rob Holding for £2m. The transfer was met with wholesale derision by the anti-Wengerian mobs who were spurred on by the mass media and their newly emerging small scale blogs. Although no one seemed to apologise for the abuse by the end of the season when Holding put in a sterling display in the Cup Final to see off Chelsea, it was apparent that this was another Wenger work of absolute brilliance. before Arsenal. Arsenal won 3-1 with goals from Giroud, Ryo and Walcott. 23 July 1865: Henry Norris born. Utterly maligned by Leslie Knighton’s libellous and inaccurate autobiography but praised by George Allison (who knew him from 1910 onwards) in his book, Norris was the man who rescued Arsenal from bankruptcy, honoured all the club’s debts (not just the “football debts”) moved the club to north London, built Highbury, and ultimately brought Herbert Chapman to the club. 23 July 1920: 14 people died and over 100 were injured in continuing rioting and rebellion in Belfast. 23 July 1942: Andy Ducat, suffered a heart attack and passed away while at the crease at in a wartime match at Lords. He played 175 times for Woolwich Arsenal and his transfer to Villa in 1912 signalled the financial desperation of the club. 23 July 1945: Jon Sammels born in Ipswich. He supported Arsenal as a boy and joined the club as youth player, winning seven youth caps for England. 23 July 1956: Bill Dickson sold to Mansfield. He had played 29 games between 1953 and 1956, having been signed from Chelsea. In later life he was a joiner and a part-time scout for Arsenal. 23 July 1973: Liam Brady signed as a pro for Arsenal. He went on to make 235 appearances scoring 43 goals. Sadly he joined the team just as a serious decline set in, and left in 1980 for Juventus. His one trophy with the club was the 1979 FA Cup. 23 July 1984: Viv Anderson signed from Nottingham Forest. He had played 328 games for Forest, but he felt the need to move on as the club appeared to be in terminal decline. He displaced Colin Hill and played 120 times for Arsenal. 23 July 1988: Arsenal beat Yeovil 5-0 in Alan Skirton’s Testimonial, with Steve Bould making his first start. 23 July 1996: Kevin Dennis was given a free transfer from Arsenal to Brentford. He never played for Arsenal, and only played 17 times for Brentford before dropping into non-league football. 23 July 2001: Junichi Inamoto signed from Gamba Osaka for £3.5m. He played in the Carling Cup and Champions League, and despite a good 2002 World Cup he moved on to Fulham, before playing in Turkey, Germany and France. 23 July 2004: Ray Parlour sold to Middlesbrough. Few players are ever universally loved by fans, but Ray Parlour came closest, and Arsenal lost more than a player when he left. He won the league three times and the cup four times with Arsenal under Wenger. 23 July 2007: Freddie Ljungberg sold to West Ham for whom he played 25 games before moving onto Seattle Sounders, Chicago Fire, Celtic and Shimizu S-Pulse. 23 July 2010: Arsenal History Society published the article “Where is the statue of Herbert Chapman at the Emirates?” which led to discussions with Ivan Gazidis and finally the erection of a series of statues around the ground. 23 July 2011: Cologne 1 Arsenal 2 (Gervinho 2). Arsenal went on to draw with Boca Juniors and New York Red Bulls before beating Benfica in the final pre-season game. 24 July 1870: Harry Storer born. He became Arsenal’s first ever player to win representative honours, and the first player to be transferred for disciplinary reasons after a major falling out with fans. 24 July 1905: Widespread interest in Woolwich Arsenal led to the Daily Mirror noting that season tickets for the season ahead had gone on sale. 24 July 1910: Woolwich Arsenal FC formally taken over by Henry Norris and William Hall. They promised the Football League to use their money to keep Arsenal in Plumstead for one year, but by this date had extended that to two years in a promise to George Leavey. Eventually they paid for the club to stay at the Manor Ground for three seasons before moving to Highbury. 24 July 1946: Arthur Milton signed pro forms. He became the last ever man to play football and cricket at the top level for England. He remains in the top ten in terms of catches in first-class cricket (758) and in 1952, he equalled the world record of seven catches in a day, and eight in the match. 24 July 1966 Martin Keown born. Although he started his career with Arsenal he was eventually sold to Aston Villa and then on to Everton, returning to Arsenal to play 311 games six years after he had left the club. 24 July 1971: Bournemouth and Boscombe Athletic 0 Arsenal 5. (Simpson 2, Radford 2, Kennedy). The first friendly of the season. Although there doesn’t seem to be a full team sheet available for this game, it is noted that Marinello played in the starting XI – an attempt to rehabilitate him after missing out on the previous season. 24 July 1989: FK Mjolner (Norway) 0 Arsenal 4 (Merson, Adams, Quinn, Campbell). The second of three games in an early pre-season tour of Sweden. 24 July 1998: The BBC reported that Arsenal had gained the “go ahead” to play European games at Wembley. It was a revolutionary move at the time, but turned into a disaster. 24 July 1990: Västra Frölunda 0 Arsenal 4 (Linighan, Smith, Merson 2). The second of the pre-season matches in Sweden. 24 July 2002: Richard Wright signed for Everton for £3.5m. He had joined Arsenal in July 2001 for what is thought to be about £2m as a potential successor to David Seaman, and in preference to Alex Manninger, but played just 12 games. 24 July 2005: SC Ritzing 2 Arsenal 5 (Bergkamp, Henry, Reyes, Hlev, Larsson). The third match of the pre-season in which we won every game of the six played. ploughed field. Eisfeld scored his first goal and appeared to have a bright future with the club. It was the series of games that was supposed to include a match in Nigeria, but never did. 25 July 1883: Joseph Lievesley born. He played in goal for Poolsbrook United, and Sheffield United and was the unfortunate keeper to be in goal in an FA Cup first round replay on 16 January 1908 in which Swindon Town beat Sheffield United. It was Swindon’s first win in the FA Cup proper for 20 years. He later played in goal for the last ever Woolwich Arsenal match. 25 July 1910: Woolwich Arsenal was formally taken over by Henry Norris and William Hall in a meeting at the Mortar Hotel, Woolwich. It was chaired by George Leavey, who was confirmed as chairman of the new limited company with Henry Norris as a director at this stage. The solicitor Arthur Gilbert, was installed as company secretary. 25 July 1921: On 25 July Arsenal published its annual report, showing itself at last back in profit, to the tune of £5434 – about £250,000 today – without taking into account the particular inflation that has occurred in football above and beyond in the country at large. 25 July 1945: Although the war was over and it had been announced that the FA Cup would resume in 1945/6 it was felt it would be impossible for football league clubs to get their teams back together with demobilisation still being a long way from completion. On this day the league divided into North and South divisions although there was opposition to the plan. 25 July 1972: Arsenal 2 Watford 0 (Kelly, George). Playing Watford as the first pre-season game was a tradition of the time as Arsenal shared training facilities with Watford. It was the first of four matches before the start of the campaign. 25 July 1987: Arsenal beat Morton 1-0 in Nigel Winterburn’s first game. He went on to play 440 league games for Arsenal. 25 July 1988: Steve Williams left Arsenal for Luton Town. He was replaced in the team by Michael Thomas. 25 July 1992: First game for John Jensen and Ian Selley in friendly v Byafossen. Selly showed a lot of promise, but when he suffered a broken leg it affected his subsequent game and he spent his later career playing in non-league football. 25 July 1998: David Grondin signed from St Etienne. He made one Premier League, two League Cup and one UEFA Champions League appearance before going on loan to Cannes Beveren and Dunfermline Athletic for whom he finally signed. 25 July 1998: Double winners Arsenal drew 1-1 away to Luton, making it two draws and one defeat in the first three pre-season games. 25 July 2003: Jens Lehmann signed from Borussia Dortmund for £1.5m. He went on to become the only goalkeeper ever in the top division to go a whole league season undefeated. 25 July 2003: Arsenal beat Austria Wien 2-0 to record their first pre-season win after a defeat and two draws. Bergkamp and Jeffers scored the goals. 25 July 2012: Pedro Botelho transferred to Atlético Paranaense. He never played a league game for Arsenal but went on five separate loan deals after signing in 2007, prior to this transfer. 25 July 2015: Arsenal beat Lyon 6-0 in the Emirates Cup with goals from Giroud, Oxlade-Chamberlain, Iwobi, Ramsey, Ozil and Cazorla. This was part of the run in which the club won every pre-season game. 26 July 1887: James Maxwell, was born in Kilmarnock for whom he first played before moving to Sheffield Wednesday and then Arsenal. At Wednesday he competed with Harry Chapman (the brother of Herbert) for the right wing position. 26 July 1912: AGM of Woolwich Football and Athletic Company Limited. Norris acted as chair and he took the opportunity to tell the audience that crowd figures were too low for the club to be sustainable. 26 July 1915: Members of the Football League and Southern League in the region discussed keeping football running in and around the capital during the war and formed the London Combination, an independent league that would have no affiliation to the Football League, with Henry Norris as Chair. 26 July 1919: Henry White signed from Brentford. He was Arsenal’s top scorer with 15 and again in the 1921/2 season when he got 19. He also had a trial for England but was an extremely troublesome player who seemed to think “retain and transfer” did not apply to him. 26 July 1920: Ian McPherson born in Glasgow. He started with Rangers but left the club to serve with the RAF during the second world war where he was awarded the Distinguished Flying Cross. He was signed in August 1946 by George Allison. 26 July 1933: Battersea Power Station came on line supplying a more reliable electrical supply to London. 26 July 1950: Dave Bowen joined from Northampton for £1000. He had been spotted as a player of potential by the son of the Arsenal manager of the day, as both he and Dave Bowen were doing their National Service. 26 July 1961: David Herd sold to Man U for £35,000. In total he scored 107 goals for Arsenal in 180 games and he became the club’s 15th best goalscorer. He won his five caps for Scotland, scoring three goals. 26 July 1973: After all the hope and hype Peter Marinello was sold to Portsmouth for £80,000 having never reached the potential he was believed to have. 26 July 1977: Last game for George Armstrong in a friendly v Red Star Belgrade. He retired from football in 1979 having become Arsenal’s top player for appearances – 621 – before O’Leary and Adams came along. 26 July 1978: Kaiserslautern 3 Arsenal 0. The first pre-season friendly, with the full first team playing the whole game. 26 July 1984: Paul Merson signed apprenticeship forms, and played his first games for the first team in 1986/7 (seven games and 3 goals) before moving on loan to Brentford. 26 July 1985: Gael Clichy born. He joined Gersoise as a child and then aged 11 moved on to Cugnaux, Muret, Tournefeuille and finally Cannes with whom he made the jump into the first team. 26 July 1994:First game for Stefan Schwarz in friendly v Lyn. He had played 77 games for Benfica across a three year period but only played one season for Arsenal before moving on to Fiorentina. 26 July 1996: John Lukic returned from his time at Leeds on a free transfer and played 15 games in his final five years as a pro. He then moved on to coaching and working as an after dinner speaker. 26 July 2004: Marc Overmars retired from football and became technical director of Go Ahead Eagles. He returned as a player and played 24 games in the 2008/9 season. 26 July 2008: Four years to the day after retiring, Overmars returned to play in the Jaap Stam testimonial and for his team. He became director of football at Ajax in June 2012. 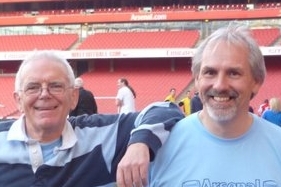 26 July 2010: The Arsenal History Society expanded its campaign for statues around the Emirates Stadium by suggesting that there should be three statues to launch the programme – which is exactly what happened. 26 July 2013: Joel Campbell went on loan to Olympiakos during which time he scored in the Champions League against Man U. In 2014/15 he returned to Arsenal, but soon went out on loan again. 26 July 2014: Arsenal played the club’s first game in the USA for 25 years at the Red Bull Arena, where Thierry Henry had played. New York won 1-0 through a goal by the son of Ian Wright. 26 July 2015: Arsenal beat Wolfsburg 1-0 with a goal by Walcott. It was the first time in the club’s entire history that it won every one of its pre-season games. 27 July 1935: Billy McCullough born. He played initially for Portadown and then in 1958 was signed by Arsenal being one of the first players signed by George Swindin. 27 July 1971: John Matthews joined as an apprentice. He became a professional in 1973 and then made his first appearance in the league in the opening match of the 1975/6 season. 27 July 2000: Brian McGovern joined Norwich City. He only played one league match for Arsenal, but played five on loan to QPR. He played 21 for Norwich in the next two years before playing briefly for Peterborough and then moving back to Ireland. 27 July 2002: Arsenal’s friendly against Rapid Vienna in Austria abandoned after rioting among local fans. The problem was entirely focussed on the directors of the club which had not won the league since 1996 and finished 8th the previous season. 27 July 2005: FC Utrecht 0 Arsenal 3 (Pires, Reyes, Henry). It was the fourth of six pre-season games in which we won every game. 27 July 2006: The Highbury clock was erected onto the wall of the Emirates Stadium. The new clock inside the ground, based on the design of the original clock of Highbury was unveiled in 2010. 27 July 2009: Szombathelvi Haladas (Austria) 0 Arsenal 5 (Bendtner 2, Eduardo 2, Van Persie). One of seven pre-season games that summer. 27 July 2012: Arsenal lost a pre-season game against Man City as some supporters became anxious about the club’s direction following the departure of Robin van Persie and Alex Song. It was one of 12 pre-season matches that summer. quoted in the press of around £3m, with Ospina replacing Fabianski. By early 2015 Ospina had become first choice keeper. 28 July 1901: Bill Seddon born in Clapton and after playing junior football moved to Gillingham, and had an unsuccessful trial with Villa before coming to Arsenal in December 1924. 28 July 1920: The first ever women to serve on a jury in the Quarter Sessions (the Crown Court) were sworn in. 28 July 1937: There was an assassination attempt on King George VI in Belfast by the IRA. 28 July 1951: Ray Kennedy born. He was initially rejected by Stanley Matthews, when he was manager at Port Vale as an apprentice being told at the age of 16 that he was “too slow to be a footballer”. that no one who was there could ever forget. Arsenal won 4-2 with goals from George (2), McNab and Graham. 28 July 1972: David Price signed professional forms having joined Arsenal in 1970, and made his first team début aged 17 in the end-of-season game against Leeds on 9 May 1973. 28 July 1975: Arsenal had a 2-1 win over Notts County, Hornsby and Kidd getting the goals. Then, in a further sign of cutting back, and the decline in Arsenal’s esteem, rather than go to Europe, the club did a three match tour of Scotland. 28 July 1978: First game for goalkeeper Paul Barron (friendly v B. Dortmund) which Arsenal won 1-0. Barron came on as a sub for Pat Jennings. 28 July 1979: First game for John Hollins (friendly v Munich 1860). Hollins came on as a substitute for David Price in a 1-1 draw. It was noted that Macdonald was not playing, and indeed the following day he retired from football. 28 July 1989: Sigurður Jónsson known as Siggi signed from Sheffield Wednesday for £475,000 but his time with Arsenal was plagued with injury and he only made 8 appearance. He was subsequently voted one of the 10 top Icelandic players. 28 July 2000: Overmars and Petit signed for Barcelona. At €40.6 million Overmars was the most expensive Dutch player of all time but injuries inhibited his style and he rarely showed the quality that he had delivered at Arsenal. Including wages he cost Barcelona around £4,000,000 a game. 28 July 2002: Arsenal signed Gilberto Silva for just £4.5m. The low fee came because Atlético Mineiro had not paid their players, were banned from transfer deals, and there were problems getting the work permit despite the fact he went on to captain Brazil. 28 July 2009: Kolo Toure sold to Man City for £14m thus making Arsenal a profit of £13,850,000. He played 82 games for City before being transferred on to Liverpool on a free. 28 July 2014: Alex Forbes died. After finishing as a player he had worked with the coaching team at Arsenal training the reserves and A team, before emigrating to South Africa when he coached school children. He was the last survivor of the 1950 FA Cup team. 28 July 2014: Calum Chambers signed from Southampton for £16m. He came as a full back, but there was soon talk that he could also play central defender or defensive midfield. He played 23 times for Arsenal in his first season – more than in his entire Southampton career before this. 29 July 1912: David Neave transferred to Merthyr. He had played for Arsenal in two separate spells between 1904 and 1912, making 168 appearances (154 in the league) and scoring 32 goals (30 in the league). 29 July 1956: Viv Anderson born. He joined Arsenal from Nottingham Forest and played 120 games over 3 seasons before moving on to Man U. While with Arsenal he made 16 appearances for England and scored two goals for them. 29 July 1972: Lausanne 0 Arsenal 6 (George 2, Kennedy 2, Radford 2). The second in a series of four pre-season games. 29 July 1976: Malcolm MacDonald signed from Newcastle for £333,333. There was an argument about the price between the clubs and eventually the Arsenal chairman said, “one third of a million and not a penny more.” And so it was. 29 July 1979: Three years to the day after being signed Malcolm Macdonald announced his retirement from football. There is no doubt that without his injury he could have helped Arsenal to greater things and his loss was a major blow. He final games was the final game of the 1978/9 season – a 1-1 draw away to Chelsea in which he scored our goal. 29 July 1989: Arsenal 1 Porto 0 (own goal). After winning the league at Liverpool Arsenal started the new season by playing a friendly tournament at Wembley. But despite being champions only 20,000 showed up for this game. 29 July 1995: Gaelstads 1 Arsenal 6 (Merson 3, Jenson, Bergkamp, Wright). Having appointed Rioch as manager Arsenal went on a three match tour of Sweden. 29 July 2000: Micky Thomas joined Wimbledon (his final club) playing nine times for them. After retiring from football, he set up his own security service, called Stop Taking the Michael, and has played for Liverpool legends. in pre-season. Bergkamp scored the only goal, slipping the ball through the keeper’s legs. 29 July 2005: Ajax 0 Arsenal 1 (Lupoli). Part of the pre-season run in which Arsenal won every single match. 29 July 2009: Hannover 96 1 Arsenal 1 (Fabregas). Part of a seven match pre-season, prior to the notorious Champions League qualifier in which the media and Uefa conspired against Eduardo. 29 July 2011: Ever anxious to put the boot in, on this day the BBC described Wrexham 2 Arsenal 1 in the FA Cup 3rd round on 4 January 1992 as one of the biggest shocks of all time. And if it wasn’t then it was Chapman’s defeat by Walsall. It seems no other club has cup shocks. Only Arsenal. 29 July 2012: After a 2-0 pre-season defeat to Man C Arsenal could only draw 2-2 with Kitchee. Walcott and Eisfeld scored in the Hong Kong Stadium. The team won only one of their first team pre-season games and it presaged a poor start to the season. 29 July 2015: Following Diaby’s release on 10 June 2015, he signed for Marseille on this day. After continuing injury problems in the first half of the season, he made his return on 18 March 2016, coming on as a substitute in Marseille’s 5–2 home defeat to Rennes. On 3 April 2016, he started in a league match against Bastia, his first league start in over three years. 29 July 2015: Wojciech Szczęsny loaned to Roma for one year playing 31 league games for the club in the course of the 2015/16 season. 29 July 2017: Arsenal beat Benfica 5-2 in the Emirates Cup with two goals from Walcott, one each from Giroud and Iwobi. The game marked an early appearance from Reiss Nelson. 30 July 1912: William Garbutt, ex-Arsenal man, appointed manager of Genoa CFC. Genoa was seen to be an English town in Italy, and Garbutt sought work in the docks – but within weeks he was given the job of being head coach of the club. 30 July 1915: Archie Macaulay born in Falkirk. He played at first with Rangers and then West Ham, served his country in the Army Physical Training Corps, and later signed for Brentford from whom he was signed by Arsenal in July 1947 for £10,000. 30 July 1923: Arthur Hutchins was given a free transfer to Charlton then of Division III South, having played 108 league games for Arsenal. 30 July 1934: Death of Lt Colonel Sir Henry Norris – the man who rescued Arsenal in 1910, built Highbury in 1913, and hired Herbert Chapman in 1925. Contrary to his current reputation he was very generous to the club’s staff, and always fought for Arsenal against vested interests elsewhere. See Henry Norris at the Arsenal for the full story of his work with the club. 30 July 1938: The first edition of the Beano comic went on sale while those who liked slightly more serious matters would have been eagerly reading the new summer publications including “Brighton Rock” (Graham Greene), “Scoop” (Evelyn Waugh) and the hit novel of the year “The Code of the Woosters” by PG Wodehouse. 30 July 1962: Jon Sammels signed as a professional. He scored on his debut in 1963 and went on to play 212 games all told, including making 21 appearances in the first Double season. 30 July 1969: Kaiserslautern 2 Arsenal 2 (15,000) (Radford, George). The third of four pre-season games. 30 July 1974 Brian Clough became the new manager of Leeds United, but his assistant Peter Taylor remained at Brighton as manager. Brighton had finished two places off relegation from the 3rd division under Clough, which is exactly where they ended the following season under Taylor. 30 July 1975: Hearts 0 Arsenal 2 in front of 11,000 fans. Kidd was injured on 20 minutes and replaced by Radford, but not before putting Hornsby through to score. Eddie Kelly ran the defensive side of the team excellently and Hearts hardly had a chance to get anywhere near the Arsenal goal. 30 July 1976: Arsenal 2 Notts C 0 (Ross, Macdonald). It was the first friendly ahead of the new season. 30 July 1985: Windsor and Eton 0 Arsenal 1 (Woodcock). First of four pre-season friendlies. 30 July 1989: Arsenal 1 Liverpool 0 (Bould) Just 23,000 turned up at Wembley for the second of two games in the Makita Tournament. 30 July 1991: Arsenal 2 Celtic 2. Paul Davis Testimonial. He stayed with the club until 1995, making 447 league appearances all told and scoring 37 goals. 30 July 1997: PSV Eindhoven 1 Arsenal 0 in a pre season friendly. 30 July 2001 Real Mallorca 0 Arsenal 2 (van Bronckhorst, og). The fourth of seven pre-season games. 30 July 2007: Reyes, one of the Invincibles, left Arsenal. He had just had a season long loan with Real Madrid, playing 30 games for them, having played 69 for Arsenal across three seasons. 30 July 2015: Jon Toral loaned to Birmingham City for the season. He played 36 games, scored 8 goals, and won awards for Goal of the Season award, Players’ and Supporters’ Player of the Season awards. 30 July 2017: Arsenal lost to Sevilla 2-1 in the Emirates Cup, with a goal from Lacazette. 31 July 1910: After the Metropolitan Police sent a telegraph message to the captain of the SS Montrose en route to Canada to say Dr Crippen was on the ship he was arrested upon arrival. It was said to be the first use of the telegraph in this way. 31 July 1931: A report of the Committee on National Expenditure recommended the slashing of government spending to try to salvage the economy. Nothing changes! 31 July 1951: Ian McPherson sold back to Notts County. He had played 152 games for Arsenal, and won a league winners medal in 1958. After County he moved to Brentford and then into non-league football. 31 July 1961: Joe Haverty sold to Blackburn for about £25,000. Joe spent one year with Blackburn, before moving on to Millwall, Celtic and Bristol Rovers. 31 July 1970: Kungsbacka BI 0 Arsenal 5 (Sammels 2, Kennedy, George 2). The third of five pre-season games. each club’s victory in their respective leagues. 31 July 1974: Cardiff 1 Arsenal 2. Brian Kidd’s debut, having signed from Manchester United. He went on to play 77 games for Arsenal before moving to Manchester City. 31 July 1979: Arsenal played out a second 1-1 draw with Duisburg, (Arsenal’s goal coming as an o.g.) in front of 5,000. Paul Vaessen who clearly looked like a player of the future, came on as a substitute. 31 July 1981: Colin Hill signed professional terms, having played for Hillingdon Borough before moving to Arsenal as a schoolboy in 1977. He made his debut in April 1983. 31 July 1983: Meppen (of Germany) 1 Arsenal 4; the first game for John Lukic and Charlie Nicholas. 31 July 1994: Raufoss 0 Arsenal 9 (Wright 3, Merson 2, Campbell 2, Dikov, Carter). Having lost their first tour game against a local side, Arsenal got themselves back together in this game. 31 July 1995: Celtic 2 Arsenal 1. A pre-season game as speculation mounted that the manager was going to be sacked. There was talk of who might come in, but no one got anywhere near the correct prediction. 31 July 2005: Porto 1 Arsenal 2 (Ljungberg 2). The final game of the tour meaning Arsenal had won all of their pre-season games. 31 July 2006: Schwadorf 1 Arsenal 8. In the build up to the opening match at the Emirates. 31 July 2008: Gary Lewin left Arsenal to work as a physio for England. He later suffered a dislocation to his left ankle and a fractured fibula, back of the tibia and ligaments while celebrating a Sturridge goal in a world cup match England lost. 31 July 2008: Tottenham bought David Bentley from Blackburn for £15m of which £7m went to Arsenal. He played just 42 games for the club before going on a series of loans to Birmingham, WHU, Rostov, and Blackburn. He later opened a restaurant. 31 July 2014: Carl Jenkinson loaned to West Ham for one season. He had played 37 league games for Arsenal, and became a regular in the WHU side playing to much acclaim and played on for two seasons, until injured. 31 July 2015: Daniel Crowley loaned to Barnsley until October during which time he played 11 league games for the club. 31 July 2015: Isaac Hayden loaned to Hull City for the season. He played 18 league games and scored one goal. The dates in this file are being added to all the time, and come from a whole variety of sources including the internet and a variety of printed volumes. If you notice an error please write to Tony.Attwood@aisa.org – ideally with a correction. (Just telling me I am wrong, without giving a clue to either the right information or how you know I am wrong, is not quite as helpful as it might be). I would particularly like to mention Richard Lerman and David Brown, and their wonderful (but now tragically out of print) volume “The Gunners: Day to Day Life at Highbury”, which is a mine of information. Also thanks of course to Andy Kelly, who has not only supplied dates and information, but who was involved in the “Day to Day Life” volume, and quite rightly is acknowledged therein. Also to Arsenal Football Club whose own On This Day appears on www.arsenal.com And “Arsenal On This Day” by Paul Donnelley (Pitch Publishing). Also where would any of us be without “Arsenal a complete record” by Fred Ollier (Breedon Books), and “Arsenal the football facts” by Dean Hayes (John Blake). If I have missed another sourcebook, please do let me know and I will correct this at once.